Based in New York City, Black 47 is often described as a Celtic rock band though they use many different influences in their music, including Reggae, Hip Hop, Modern and Trad Jazz, Lower East Side Noise and other sounds from the streets of New York City. The band is made up of Irish, British and American citizens, and was formed in the Bronx, by Larry Kirwan and Chris Byrne in 1989. Their name is derived from 1847, the worst year of the Great Irish Famine. Black 47 began as a two-piece with Larry Kirwan on vocals, electric guitar and drum machine, and Chris Byrne on uilleann pipes, tin whistles and bodhran. Their first performance was in the Bronx on October 2, 1989. During the first year a horn section was added with Fred Parcells on trombone and Geoffrey Blythe Dexy's Midnight Runners on saxophones. Later they were joined by Thomas Hamlin of Chill Faction on African percussion. The band was in the studio within months of forming and released a cassette, Home of the Brave, in February 1990. This was heard by Frank Murray, manager of The Pogues, who signed them up for a new label he was forming. He took them over to London where they opened for The Pogues in Brixton Academy in December 1990. One can hear the vociferously mixed-reception they received on another self-released cassette, Live in London. Due to personal tragedy, Murray scrapped the label and in 1991 the band released an eponymous independent album. They went into the studio with The Cars' Ric Ocasek who produced a five song eponymous CD released in Oct. 1992 on EMI Records which spawned the hit, Funky Ceili. Fire of Freedom a 14 song CD was released in 1993. Home of the Brave followed in 1994 with Jerry Harrison serving as producer. In 1996 the band shifted from EMI to Mercury Records with whom they released Green Suede Shoes. The band continued to play over 150 dates every year touring the US, Canada, Ireland and the UK but hit some stormy personal weather. Because of their independent stance on affairs in the North of Ireland, their UK record companies refused to give them any support, thus cutting off the lucrative European market. Then beginning in 1996 a series of events shook them. Their sound man/recording engineer,Johnny Byrne, fell from his fourth story apartment window on E. Third Street, NYC, and was killed. The band crashed on black ice Interstate 95 near Old Lyme, Connecticut, coming home from a gig at The Strand in Providence. On St. Patrick's Day, a New York City policeman accidentally shot himself at their concert in The Academy, NYC - the policeman was killed, and two people close to the band were seriously injured. Soon after, John Murphy, a close friend and associate, was injured in a motorcycle accident in New Orleans and remained in a coma until passing away some years later. Thomas Hamlin's apartment burned down and he escaped with only his cat and passport. Most of this is summed up in their song "Those Saints" from the 2000 CD release, Trouble in the Land. 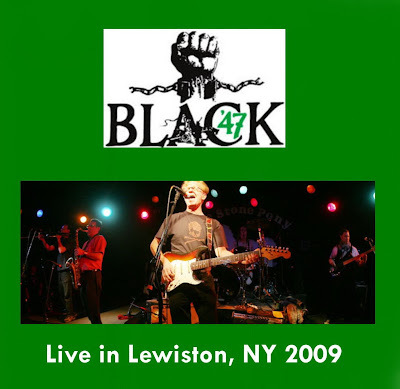 In their tenth year together, Black 47 released a limited edition compilation Ten Bloody Years and their first live recording Live In New York City which took place in the now defunct Wetlands nightclub. The band's appeared in the Matt Dillon/Danny Glover film, Saint of Fort Washington. Their cinematic music has been featured in many films and TV shows. In 2000, founding member Chris Byrne left the band to focus on his solo music project Seanchaí and the Unity Squad. New York Town (2004) is a tribute to their home base and focuses on the city right before and after the 9/11 tragedy when many Black 47 fans lost their lives, including FDNY chaplain Mychal Judge whom the band celebrated in the song Mychal. Elvis Murphy's Green Suede Shoes was a companion piece to Kirwan's memoir Green Suede Shoes - An Irish-American Odyssey. Bittersweet 16 was released in their 16th year and is a collection of fan favorites and rare tracks - one for each year of the band's existence up to then. Political as ever, Black 47 protested the Iraq War before there even was one. On March 17, 2003, the night war was declared, at The Knitting Factory they performed a version of "Where Have All The Flowers Gone" after a vitriolic denunciation of President Bush that led to scuffles in the audience and a walk out by some of their supporters. The band soon followed this with Downtown Baghdad Blues often mentioned as the most powerful song about the conflict. Because of its appeal to working class and Lower Middle Class youth, the band traditionally has fans in the armed services. Kirwan began collecting emails from these service men and women stationed in Iraq and turned the raw material into visceral songs about the troops' experiences. Songs like Stars and Stripes and Southside Chicago Waltz songs received a tumultuous reception for the first three years of the war with many people protesting and others cheering. All the songs were collected on the critically well received CD, IRAQ, in 2008. Black 47's new release, Bankers and Gangsters is a return to their eclectic roots mixing the passionate and political in various styles of music. Produced by Kirwan at the Carriage House in Stamford, CT.
Black 47 have made many television appearances including The Tonight Show with Jay Leno, Late Show with David Letterman, Late Night with Conan O'Brien and Gay Byrne's Late Late Show in Ireland. thanks for posting this show - i've gotten several of the later B47 studio discs, incl "elvis murphy's GSS" and liked them a lot. i just ran into a great 1993 show from the lonestar in NYC that prompted me to search around a bit - early on, the horn arrangements with the psychedelic guitar reminded me of a very literate irish-styled oingo boingo. some very imaginative (and energetic!) music from kirwan and whoever he's got. i didn't know about the bands' disasters you outlined there. tough breaks indeed. hasn't kept down whoever's left eh? greetings from chicago and a happy st. paddy's to ya! CIRCLE J - Video "Roadtrip Asturias"
DROPKICK MURPHYS - Pre-Order "Live on Lansdowne"
THE RIGHS - Full album credits for "Roses"
COMO LAKE ROVERS - "Friday Night"
LIVING LÂCHE - "Folk Rock Mountain" Out Soon!